BACKGROUND AND PURPOSE: The development of flat panel detectors (FPDs) has made cone-beam CT feasible for practical use in a clinical setting. Our purpose was to assess the usefulness of cone-beam CT using the FPD in conjunction with conventional digital subtraction angiography (DSA) for performing superselective intra-arterial chemotherapy for head and neck tumors. MATERIALS AND METHODS: Twenty-three consecutive patients (43 feeding arteries) were prospectively examined. All of the patients underwent intra-arterial rotational angiography using an FPD system, and the cone-beam CT was reconstructed from the volume dataset. Two radiologists evaluated the quality of the cone-beam CT and then evaluated whether the additional information provided by the cone-beam CT was useful for the interventional procedures. RESULTS: In 41 (95%) of 43 arteries, the extent of contrast material perfusion was sufficiently visualized on cone-beam CT. In 20 (47%) of 43 arteries, the DSA plus cone-beam CT was superior to the DSA alone regarding the precise understanding of vascular territory of each artery. This information was helpful for predicting the drug delivery for superselective intra-arterial chemotherapy, especially in deeply invasive tumors with multiple feeding arteries. CONCLUSION: In superselective intra-arterial chemotherapy for head and neck tumors, cone-beam CT with FPD provides useful additional information, which allows interventional radiologists to determine the feeders, as well as the dose of antitumor agent for each feeder. For advanced head and neck tumors, intra-arterial infusion chemotherapy has the advantage of delivering a high concentration of chemotherapeutic agents into the tumor bed with fewer systemic toxic effects than normally seen with systemic chemotherapy. Recent advances in the therapeutic techniques of interventional radiology, including the development of some types of microcatheters, now enable us to perform superselective arterial infusion to head and neck structures.1–4 Because conventional digital subtraction angiography (DSA) provides only 2D projections of the vascular anatomy, however, the identification of the tumor feeding artery is occasionally difficult due to the presence of a complex anatomy or multiple feeding arteries. In addition, staining of head and neck tumors is not always observed on DSA. The purpose of our study was to assess prospectively the usefulness of our cone-beam CT system, in conjunction with DSA, for both the diagnosis and the performance of superselective intra-arterial chemotherapy in patients with head and neck tumors. Between April 2005 and January 2006, 29 consecutive patients, who underwent the superselective intra-arterial chemotherapy for histopathologically confirmed head and neck tumors, were prospectively included in this study. Because in 6 patients with carcinomas of the mouth the arterial infusion of indigocarmine dye provided the exact identification of tumor feeding arteries, the interventional radiologists decided that the intra-arterial cone-beam CT was unnecessary for these patients. Thus, the study population consisted of 23 patients (18 men and 5 women; age range, 45–85 years; mean age, 66.9 years). Before DSA, enhanced MR imaging and/or CT was performed in all 23 of the patients. All of the angiography examinations (DSA and cone-beam CT) were performed by using an angiography system with an FPD of direct conversion type on a motorized C-arm (Safire; Shimadzu, Kyoto, Japan). This detector has a pixel pitch of 150 μm and an array format of 1472 × 1472 pixels, covering a detector size of 22 × 22 cm2. An amorphous selenium film, approximately 1000-μm thick, is used as an x-ray converter. The cone-beam CT acquisition consists of synchronized x-ray exposure and a panel readout under the continuous rotation of the C-arm. The 3D datasets were obtained from single rotation with a FOV of 23 × 23 cm using the floor-mounted C-arm. This series covers a total angular range of 195° around patients, with the rotation of 20° per second during the administration of contrast material. A total of 280 projections with x-ray parameters of 65 kV and 695 mA were acquired at 30 frames per second with 1024 × 1024 matrices. The distance between the focal spot and the detector was approximately 115 cm and that between the focal spot and isocenter was approximately 73 cm. The image datasets were immediately transferred to a workstation (DAR-5000, 3D-ANGIO option V3.0; Shimadzu), where a volume dataset was reconstructed in a CT-type dataset consisting of many sections with the thickness of voxel size and visualized with volume-rendering technique as 3D and multiplanar reconstruction images. With isotropic voxels, the length of the volume of interest in the patient's longitudinal axis (z axis) is 512 times the voxel side length (a voxel side length of 0.254 mm and the 512 × 512 matrix; the column has a dimension of 13 cm × a length of 13 cm). Volume images were available approximately 5 minutes after volume data were transferred to a workstation. Images were displayed on the host personal computer (immediately outside the operating room) and on an in-room display, and radiologists could independently examine the desired cross-section images on the workstation from axial or coronal view when they required further information to evaluate the tumors. All of the procedures were performed by 1 of 2 experienced interventional radiologists (S.K., N. Ohnari, with 11 and 20 years of experience in interventional radiology, respectively) at our institution after written informed consent was obtained from each patient. The study was approved by our institutional review board. Using the Seldinger technique, the tip of a 5F catheter was guided from the femoral artery to the descending aorta. 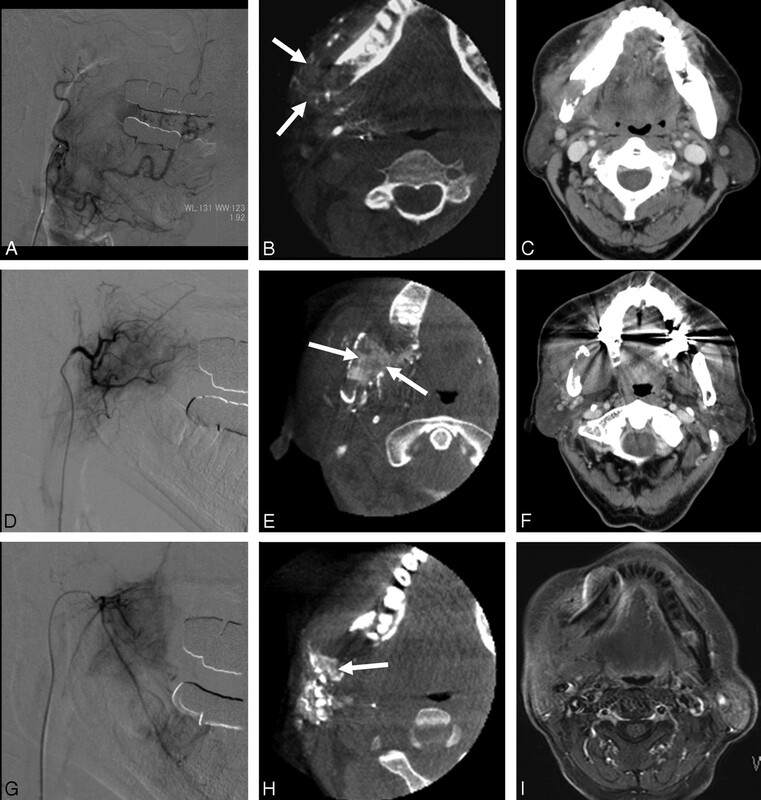 For DSA, all of the patients underwent cerebral angiography that included the unilateral or bilateral common carotid angiography to evaluate the vascularity of the head and neck tumors and the vascular anatomy. Then, the interventional radiologists underwent the selective catheterization distal to the external carotid artery by use of a 2.3F microcatheter, and the DSA was performed. For all of the DSAs, the contrast material (Iopamilon 300; Schering, Berlin, Germany) was manually administered using a syringe. If the tumor was present in either the tongue or oral cavity (buccal, gingival, and palatal surfaces), the feeding vessels were identified by staining the tumor after slow arterial infusion of 1.5 mL of indigocarmine dye. During the injection of indigocarmine dye, we observed whether the tumor was stained, and, if so, which part was stained.1 Then, the cone-beam CT was performed in the same tip of the catheter as the DSA, when the interventional radiologists required the further information according to a tumor in performing a superselective intra-arterial chemotherapy. The start of contrast material injection, the volume, and the injection rate of contrast material were determined based on work performed previously in the DSA so that the contrast material filled the artery and demonstrated tumor staining throughout the rotational angiography. For rotational angiography, a total of 5.5–1.1 mL of the contrast material containing 100 mg/mL of iodine, which was diluted by the saline, was automatically administered with a scanning delay of 1 second at a rate of 0.5–1.0 mL/s using a power injector (Autoinjector 120S; Nemoto Kyorindo, Tokyo, Japan) during the entire acquisition. Except for the treatment in cervical lymph node metastasis, the intra-arterial chemotherapy consisted of cisplatin and carboplatin administered at doses of 100 and 450 mg/m2 for patients under 65 years of age, respectively. The dose of antitumor agent was reduced for patients older than 65 years or patients with adverse factors (renal dysfunction, liver dysfunction, leukopenia, thrombocytopenia, etc). Therefore, regimens of the intra-arterial chemotherapy varied, and the total doses administered in the treatment had a range for superselective cisplatin-carboplatin (290–540 mg) and for superselective cisplatin (30–100 mg). When multiple feeders existed, the dose of antitumor agent for each feeder was determined by the percentage of tumor stained with DSA and cone-beam CT on each vascular injection. When no spread of the contrast material throughout the entire tumor was confirmed on cone-beam CT, the superselective intra-arterial chemotherapy was not performed. As a result, the final plan for superselective intra-arterial chemotherapy was formulated based on the findings of DSA and cone-beam CT by interventional radiologists. We assessed the usefulness of cone-beam CT in conjunction with the DSA. Two radiologists (N. Ohnari and J.M. ), who did not take part in image manipulation, independently reviewed the DSA and cone-beam CT. These radiologists were only informed of the final diagnoses of the lesions but were blinded to the angiography findings (injecting indigocarmine testing), physical examination results, and laryngoscopy reports. The radiologists first assigned scores to the DSA on hard-copy films alone and then immediately assigned scores to the cone-beam CT obtained in the same patient. The DSA and cone-beam CT were always evaluated in conjunction with the preinterventional CT and/or MR imaging studies. After independent interpretations were performed, the differences in assessing both radiologists were resolved by consensus. The cone-beam CT was displayed on a diagnostic monitor (Flexscan L365; EIZO NANAO, Ishikawa, Japan), and these radiologists could examine the desired cross-section images on the workstation from the axial or coronal view, when they required further information to evaluate the tumor. For both the DSA and cone-beam CT, the following score was used to evaluate the diagnostic value regarding the tumor feeding arteries: score 1, excellent; score 2, adequate; score 3, less than adequate for diagnosis; and score 4, not diagnostic. In an attempt to predict the extent to which neighboring normal tissue had been exposed by the intra-arterially administered antitumor agent, these radiologists also evaluated the cone-beam CT for the extent of contrast material perfusion as follows: 1, excellent (the extent of contrast material perfusion was clearly visualized and perfusion contrast appears high); 2, good (satisfactory visualization but perfusion contrast somewhat reduced); 3, adequate (visualization of the extent of contrast material perfusion still sufficient); 4, insufficient visualization; and 5, not visible. To evaluate the level of interobserver agreement of scores of image quality, a Kendall W test was performed. The Kendall W coefficients between 0.5 and 0.8 were considered to indicate good agreement, and the coefficients higher than 0.8 were considered to indicate excellent agreement. Tumor characteristics, cone-beam CT techniques (catheter location, volume and injection flow rate of contrast material, and timing of acquisition and scanning delay), and superselective intra-arterial chemotherapy protocol are summarized in Table 1. The DSA and rotational angiography were successfully performed in all 23 of the patients (a total of 43 arteries: 4 arteries in 1 patient, 3 arteries in 5 patients, 2 arteries in 7 patients, and 1 artery in 10 patients) without any complications, and a diagnostic image was obtained in all of the patients. The superselective intra-arterial chemotherapy was performed in a total of 49 arteries (4 arteries in 2 patients, 3 arteries in 6 patients, 2 arteries in 8 patients, and 1 artery in 7 patients). The cone-beam CT was not performed in 8 of these 49 arteries, because the interventional radiologists did not require any further information than the conventional DSA. In 2 of 43 arteries in which cone-beam CT were performed, the superselective intra-arterial chemotherapy was not performed, because no spread of the contrast material throughout the entire tumor was confirmed on cone-beam CT. In an artery-by-artery analysis, the diagnostic quality with respect to tumor feeding arteries with and without cone-beam CT is shown in Table 2. Regarding the diagnostic value of the tumor feeding arteries, the interpretation of cone-beam CT in conjunction with the DSA was scored to be excellent or adequate in 39 (90%) of all 43 arteries. Twenty four (56%) of 43 arteries were difficult to diagnose with confidence based on the DSA findings alone. In 20 (83%) of these 24 arteries, the diagnostic quality was scored as excellent or adequate when the cone-beam CT was available. Regarding the visualization of the extent of contrast material perfusion, the image quality with cone-beam CT was scored to be excellent in 18 (41.9%) of all 43 arteries, good in 19 (44.2%), adequate in 4 (9.3%), insufficient in 2 (4.7%), and not visible in 0 (0%). Two cone-beam CTs classified as insufficient visualization were degraded by a dental artifact. In a lesion-by-lesion analysis, the diagnostic value of cone-beam CT with respect to the treatment with superselective intra-arterial chemotherapy was significantly better than that of the DSA (Wilcoxon signed rank test, P < .01). The cone-beam CT changed the diagnosis of tumor feeding arteries or treatment plan for superselective intra-arterial chemotherapy (grade 1) in 9 (39.1%) of 23 patients, improved confidence in the diagnosis of tumor feeding arteries or therapeutic effect (grade 2) in 10 (43.5%), had no effect on the diagnosis or the treatment plan (grade 3) in 3 (13%), and was equivalent to the DSA (grade 4) in 1 (4%). There was no case scored as grade 5. All 9 of the patients scored as grade 1 had a deeply invasive head and neck tumor with multiple feeding arteries. The reasons for grade 1 were as follows: 1) cone-beam CT allowed identification of a tumor feeding artery that could not be diagnosed by DSA (n = 4); 2) because the tumor was not enhanced after the contrast material injection on cone-beam CT, the superselective intra-arterial chemotherapy was not performed through this artery (n = 1); and 3) in the head and neck tumor with multiple feeding arteries, the amount of antitumor agent through tumor feeding artery was changed, because cone-beam CT provided the useful information for the prediction of the drug delivery (n = 4; Fig 1). Images in a 72-year-old man with a lower gingival cancer with multiple tumor feeding arteries. A, DSA and (B) intra-arterial cone-beam CT obtained in the selective facial artery. C, Preinterventional enhanced CT image at the same level. D, DSA and (E) intra-arterial cone-beam CT obtained in the selective masseteric artery. F, Preinterventional enhanced CT image at the same level. G, DSA and (H) intra-arterial cone-beam CT obtained in the selective inferior alveolar artery. I, Preinterventional enhanced MR image at the same level. Preinterventional enhanced CT and MR imaging studies (C, F, and I) show a deeply invasive tumor with destructive lesion of jawbone. DSAs (A, D, and G) obtained from the multiple tumor feeders show only faint stains, and, therefore, it was difficult to understand the vascular territory of each artery. The cone-beam CT (B, E, and H) allowed the interventional radiologists to identity the tumor stains (arrows) by a combined inspection with preinterventional CT or MR imaging studies and to determine the amount of antitumor agent for each feeding artery with confidence. For rating of the diagnostic value with respect to tumor feeding arteries, the interobserver agreement between the 2 radiologists in rating the image quality parameter was excellent for both the DSA images alone and the conventional DSA with cone-beam CT, respectively, with Kendall W values (τ) of 0.83 and 0.91. For rating of the visualization of the extent of contrast material perfusion with cone-beam CT, the interobserver agreement between the 2 radiologists in rating the image quality parameter was good with Kendall W values (τ) of 0.75. By providing more anatomic detail by continuous cross-sectional imaging, the cone-beam CT can show several potential advantages for superselective intra-arterial chemotherapy over DSA alone. The main purpose of our study was to assess the value of cone-beam CT for interventional procedures for head and neck tumors. The arterial infusion of indigocarmine dye is often helpful for identification of the tumor-feeding arteries, when the tumors can be directly seen.1 For the deeply seated tumors with multiple feeding arteries, however, the infusion of indigocarmine dye is not useful; in such cases, the cone-beam CT allows interventional radiologists to determine the feeders, as well as the dose of antitumor agent for each feeder. Previous reports have described the complications associated with intra-arterial chemotherapy for cancers of the head and neck.2–4 The local toxicity of the chemotherapy agent includes mucositis, dermatitis, skin necrosis, and peripheral and cranial nerve palsies. When the tumor was not enhanced on cone-beam CT, which occurred in 2 of 43 arteries, our interventional radiologists did not perform the superselective intra-arterial chemotherapy. Therefore, use of cone-beam CT might be helpful for preventing these complications by avoiding unnecessary infusions of antitumor agent. When it is difficult to diagnose the tumor-feeding arteries with DSA, the multiple DSA acquisitions at various angles and catheter location may be necessary, which results in an increased dose of radiation and contrast material. We suppose that the use of cone-beam CT could reduce the multiple exposures of x-ray that are usually needed with the DSA. Intra-arterial CT angiography can provide information in addition to that provided by DSA when evaluating vascular supply to the tumor.10,11 Recently, unified CT and angiography systems have been developed.12,13 In this system, the patient stays in the same position, and the scanner gantry moves in over the patient on the same table in the same room. This allows us to avoid both the time-consuming patient movement and the catheter tip retract or movement during transfer to the CT scanner or the return to the angiography suite. Our cone-beam CT does not necessitate moving the patient between the CT and angiography units, and, moreover, it does not require the higher investment cost and the spacious room for equipment installation in comparison with unified CT and angiography systems. In addition, the decision of the isocenter for the rotational field would be easier in our system, because this procedure can be performed under fluoroscopic guidance by the interventional radiologist. In conclusion, the cone-beam CT with our FPD system can provide clinically acceptable image quality as a method to monitor the perfusion of antitumor agents for the superselective intra-arterial chemotherapy in patients with head and neck tumors. This information allowed an interventional radiologist to decide the amount of antitumor agent infused in the tumor feeding arteries, especially for the deeply invasive tumors with the multiple feeding arteries. Accepted after revision March 14, 2007.